This report describes training activities in Kigali, Rwanda, January 2018, led by the International Research Institute for Climate and Society (IRI)’s John del Corral. The training visit was part of the Rwanda Climate Services for Agriculture project – a four-year initiative (2016-2019) funded by the U.S. Agency for International Development (USAID) that seeks to transform Rwanda’s rural farming communities and national economy through climate services and improved climate risk management. The purpose of the visit was install the ENACTS Data Library and Maproom software on a new, faster server at the Rwanda Meteorological Agency as well as train IT staff and meteorology staff in the installation and management of the ENACTS Data Library server. 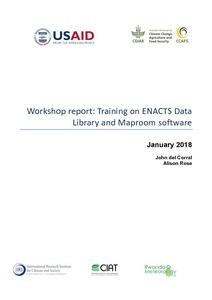 The topic of updating and adding datasets to the ENACTS Data Library was also covered during the training. del Corral J, Rose A. 2018. Training on ENACTS Data Library and Maproom software in Kigali, Rwanda. CCAFS Workshop Report. Wageningen, Netherlands: CGIAR Research Program on Climate Change, Agriculture and Food Security (CCAFS).